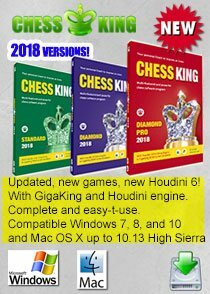 I am finishing my new DVD "Chess Blitz Fever", and have prepared another YouTube video for you all, with my win against overall World Chess Champion Vishy Anand. In how many other sports can you see the women's world champion beat the overall (men's) world champion? Isn't that cool? In fact it's one of the main reasons why I think chess is the coolest of games: with hard work and lots of passion for chess you can beat anybody! And for me, this win against the overall World Chess Champion, while only a blitz game, nevertheless is the realization of my dream, and gives me strength and desire to keep working to continue to get better at chess. 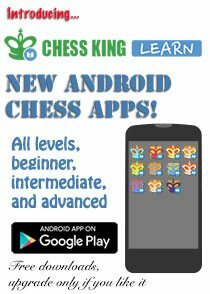 And to all girls and ladies out there, and to Moms who don't know if it's a good idea to play chess and to teach their daughters to play chess, I can say for sure that it is good for girls to play chess! 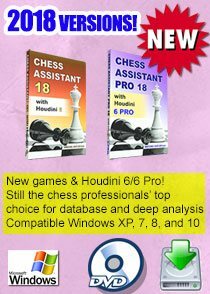 Chess teaches strong work ethics, helps to concentrate, teaches decision making, trains memory, and is a good way to practice being competitive at a young age, since later in business and in life those competitive skills will surely turn out to be quite useful. My recent YouTube video of my win against Magnus Carlsen got 28,000+ views in just 4 days, and over 200 comments. I appreciate all your 5-star reviews and comments to my videos. 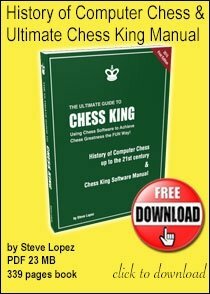 My DVD "Chess Blitz Fever" contains in the first part lots of tips on how to play better blitz chess and in the second part full commented videos of my wins (full games analyzed) against super-Grandmasters Vishy Anand, Magnus Carlsen, Levon Aronian, Vugar Gashimov, Gashimov, Alexander Morozevich, Alexander Grischuk, Judith Polgar, and Arkady Naiditsch. It will come out at the end of February and any DVD order placed before then qualifies for free shipping. 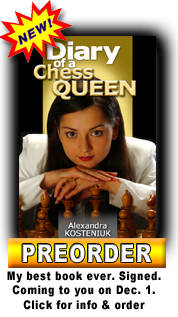 Visit also two other YouTube channels "chessqueentv"
Your are so beautiful Alexandra. Every male opponent will be checkmate in his heart before the game begins. -juneber. Thanks so much. More power to you Alex!. 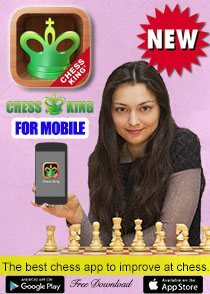 I love so much your game against Kamsky in Gibraltar, congratulations Alexandra. When you to visit Brazil? 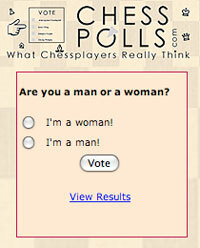 You The best female chess player in the world ! Im sorry my wrongs in Engish.